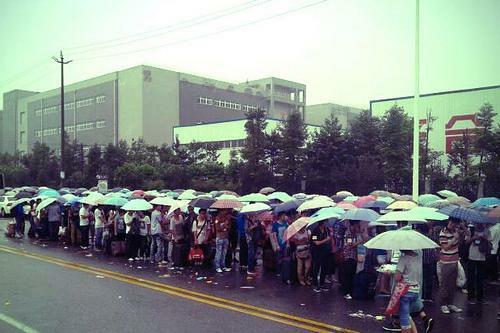 Reports from China claim that thousands of job seekers are lining up outside of Apple manufacturing partner Foxconn's Chengdu plant in hopes of landing a position at the factory as summer hiring ramps up ahead of rumored next-generation iPhone and smaller iPad launches. According to Chinese electronics blog M.I.C. Gadget, "thousands" of people gathered in front of Foxconn's Chengdu plant to vie for a large number of "summer job" slots that have only one stipulation: applicants must have good eyesight. Sources claim that openings still remain but are filling up fast and note that a smaller "iPad mini" may possibly be rolling off the assembly line. This is contrary to a previous report which had the rumored 7-inch tablet set for manufacture at Foxconn's plant in Jundiai, Brazil. Foxconn's Zhengzhou factory is also hiring workers and sources there say the plant is currently producing Apple's next-generation iPhone albeit on a very small scale. The insider claims that the production line's over 100 workers rolled out a mere five units during a recent night shift, and goes on to explain the upcoming iPhone is said to be in the "trial production stage." While AppleInsider cannot validate these claims, the report is consistent with earlier rumors that said Apple's sixth-generation iPhone is currently being manufactured. Apple's rumored next-generation handset is expected to launch some time this fall with a larger 4-inch display and newly-designed "uni-body" chassis. A smaller version of the company's popular iPad is also widely rumored to debut later this year with recent "leaks" pointing to a 7-inch screen and slightly modified case design. A report from The New York Times claims the so-called "iPad mini" will be priced below $499 to meet entry-level market demand.